The Cassini spacecraft captured this image with its wide-angle camera on Aug. 12, 2013, using a spectral filter sensitive to wavelengths of near-infrared light centered at 728 nanometers. NASA released a new infrared view of Saturn from the Cassini spacecraft, in which the ringed planet's thick clouds have the soft feel of an "impressionist's painting." 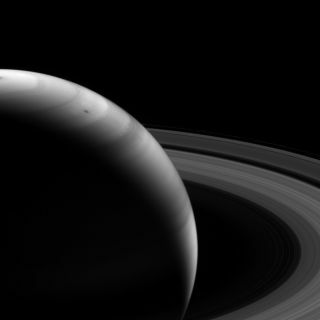 Looking toward the sunlit side of Saturn's rings, the black-and-white image was captured with the Cassini spacecraft's wide-angle camera on Aug. 12, 2013, from about 994,000 miles (1.6 million kilometers) away from Saturn's surface, according to NASA. The camera used a spectral filter sensitive to wavelengths of near-infrared light, showing the planet at a scale of 57 miles (92 km) per pixel. About a month earlier, the Cassini probe captured an even more unusual image of Saturn. On July 19, 2013, spacecraft looked back at the planet when the sun was in a total eclipse. The phenomenon provided a stunning backlight for Saturn's rings and a rare unobstructed view of Earth, which appeared as a tiny speck of light. Mars and Venus were also captured in the image. It can be difficult to tease out Saturn's atmosphere from its interior since the planet has no solid surface. Like its fellow gas giant Jupiter, Saturn boasts wide bands of clouds, which can be pushed along by fast-moving winds. NASA's Voyager mission recorded wind speeds of more than 1,100 mph (1,800 kph) at Saturn's equator. The Cassini mission is a cooperative project of NASA, the European Space Agency (ESA) and the Italian Space Agency. It launched in 1997 and settled into orbit around Saturn in July 2004 to explore the planet as well as its rings and its many moons. In 2005, Cassini deployed a lander called Huygens towards Titan, Saturn's largest moon, to collect new information about the strangely Earth-like celestial body. Cassini's mission is expected to continue until 2017, after which it will hurl itself into Saturn's atmosphere and burn up.